Today at PDC Microsoft "introduced" IE9. The word is in quotes, because there's no real version out there. In fact, the development teams have started working on it only 3 weeks ago, and there's only an internal work build. This comes a bit over a year after the release of IE8 - a much shorter release period compared to the one between 7 and 8 - and definitely shorter than the 6 years between 6 and 7. What prompted this speedy development cycle? It could be Microsoft's new dedication to internet technologies, or the rapid release cycles of Firefox and Chrome. 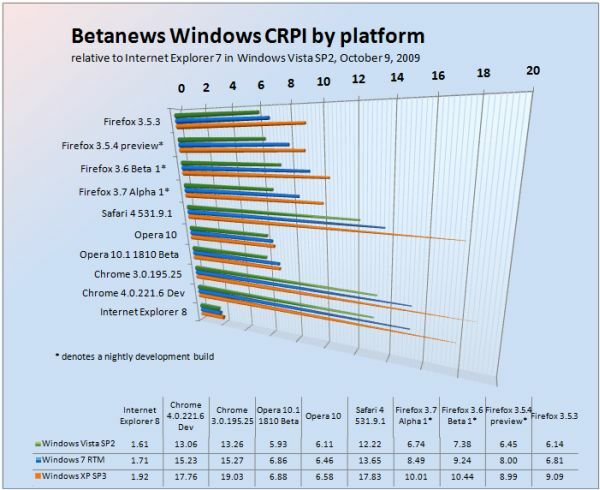 For almost a year now, sites like BetaNews have been running browser performance comparison tests. You see that tiny purple line at the bottom? That's IE8, performing at an abysmal 1.75 x IE7 (or 75% faster), compared to Google Chrome, at over 15x IE7. (To read about the test itself, read this). This shows that all browsers perform better on XP than on Windows Vista (no surprise) and Windows 7 (bad surprise). The good news is that this time, Microsoft is not going to discuss the disturbing results in endless committees, but instead started developing the next gen IE. 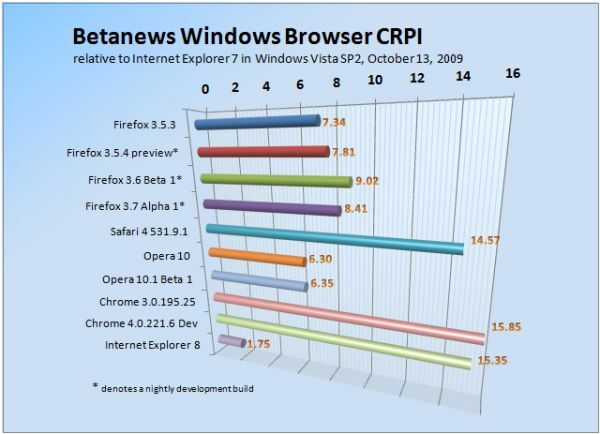 According to Paul Thurrott, a beta version of IE9 is expected at March '10, with a release following in October. As for me, I'm knee-deep in Google Chrome extension development. Fun.